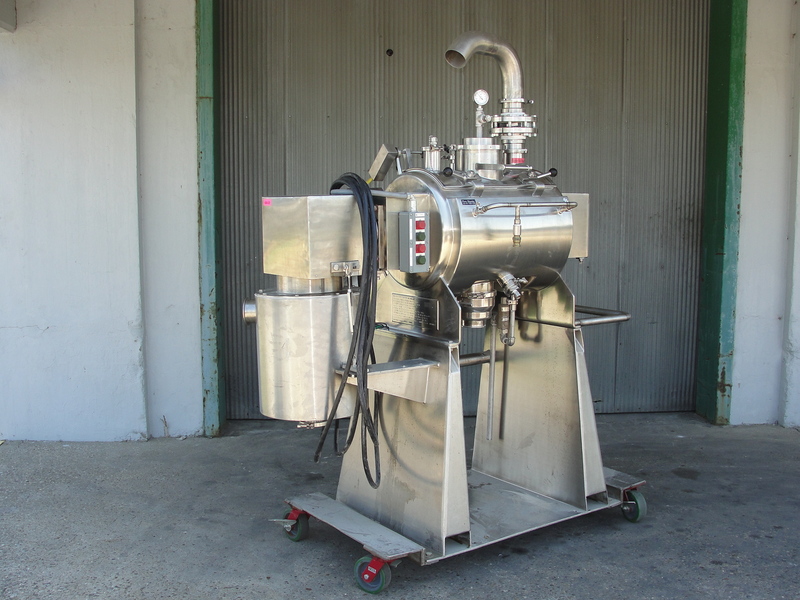 Processall 316 stainless steel jacketed sanitary plow mixer. Model 140HH (Special). Mixer has a total capacity of 140 liters or 5 cu. ft. Jacket has a pressure rating of 5 psi per 28” Hg. Vessel has an internal pressure rating of 75 psi per 28” Hg. Drum and jacket have a temperature rating of –20° F to 300° F. The discharge has a 4” manually operated ball valve. The mixer has a 10 hp chopper blade. The 4 plow blades are driven by a 10 hp motor. Both motors have a protective stainless steel cover making mixer wash down capable. The top of the unit has a 14” x 24” hinged top with 3.5”, 2.75”, 1.75”, and a 7.5” Tri-Clamp inlets. The distance from the floor to discharge is 33.5″. Requires 240/460 vac 3 phase electrical supply. Excellent condition.